Next week restoration work at the Graeco-Roman Museum in Alexandria is to restart after an eight-year pause. In 2005, the Supreme Council of Antiquities (SCA) (now the Ministry of State of Antiquities - MSA) closed the Graeco-Roman Museum in Alexandria and took it off the tourist track for restoration. According to the plan at the time, both buildings of the museum and its library were meant to be consolidated and restored while the showcases at the museum would be improved to ensure a better display of the artifacts. But due to lack of finances and expertise, and the 2011 revolution, the whole project was put on hold until yesterday when Minister of State for Antiquties Mohamed Ibrahim and Italian Ambassador to Egypt Maurizio Massari signed a memorandum of understanding on restoring the museum, the North Cemetery in Saqqara outside Cairo, and Medinet Madi archaeological site in Fayoum. Ibrahim said that funds would be provided by the Italian government and from a debt swap programme and the Italian development agency. Funds allocated amount to $6 million and €2 million respectively. The museum's restoration works, Ibrahim added, are to be carried out in collaboration with Universita della Tuscia based in Viterbo in Italy for the coming 18 months, including restoration of the building itself, the replacement of showcases, installing new lighting, ventilation and security systems, as well as renewing the overall display layout. According to the new restoration plan, said Hisham El-Leithy, general director of scientific publications at the MSA, the museum will include halls for the permanent display of the museum's treasured collection, a section dedicated to archaeological study and research, and a museum for children. Italian architects, said Ibrahim, will use state of the art techniques to make the museum more environmentally friendly. 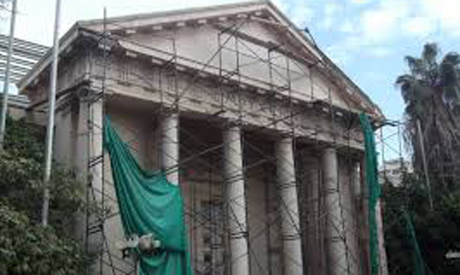 "Finally, the restoration of the Graeco-Roman Museum comes true," Ibrahim told Ahram Online. "The museum will not only be another tourist attraction, but it will provide 1,000 jobs, which in turn will contribute to the economic growth of this community." According to Massari, the agreement is testament to the health of ongoing institutional cooperation between the two countries, and to Italy's role in cultural heritage conservancy, the benefits of which go far beyond Egypt. ''There is a very clear link between culture and economic development, tourism and job creation. This is not just about culture as an end in itself, but also about improving socio-economic conditions. Egyptian citizens will be the first to benefit," Massari explained. The Graeco-Roman Museum houses a large number of Egypt's antiquities from the period roughly 300BC to the Arab Conquest in the 7th century. It was built in 1895 by Italian archaeologist Giusepe Botti and has been renovated several times along the span of its history. It was last restored almost 20 years ago.